Manny Pacquiao has decided to put his career records on the line and make a come back to boxing after hanging his gloves and become a Senator in his home country, Philippines. The boxer-turned-politician has asked promoter Arum to find an opponent and venue for a comeback fight in Las Vegas on either October 29 or November 5. “I hope to get things done in a week or so,” Top Rank boss Arum told the Manila Bulletin. Arum, who has guided Pacquiao’s career since 2005, has whittled the list of possible foes down to three names: Danny Garcia, Jessie Vargas and the winner of the unification fight between Terence Crawford and Viktor Postol. Garcia holds the WBC welterweight crown and is undefeated in 32 contests, while Vargas holds the WBO strap and has lost just once in 29 fights. WBO super-lightweight champion Crawford faces WBC champion Postol in Las Vegas on July 23 in a fight which will see both boxers put their unblemished 28-0 records on the line. “I’ve said the three guys that are now being considered would be the two welterweight champions Danny Garcia and Jessie Vargas,” Arum said on boxingscene.com. Pacquiao, a winner of world or Ring magazine titles in a record eight weight divisions, has said any return must not interfere with his senate duties. As a result, Pacquiao will train with Freddie Roach in the Phillippines before heading to Los Angles and Arum will ditch the traditional pre-fight tour of multiple cities to promote the fight. “He would train in the Philippines and leave on the 16th to come to the US, train for two weeks and then come to Vegas,” said Arum. “We’ll just do satellite interviews,” added Arum, who is looking at the MGM Grand, Mandalay Bay and the T-Mobile Arena as possible venues for the fight. 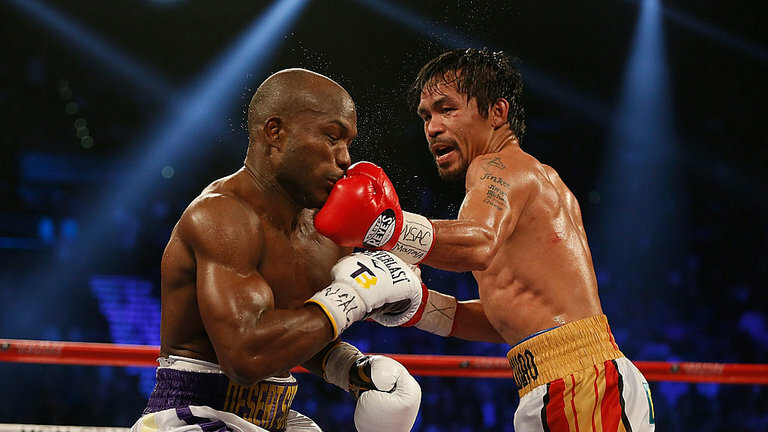 Pacquiao, meanwhile, admitted his love of boxing has not faded since hanging up his gloves after defeating Timothy Bradley in his last fight in April. “When you put your passion and your dedication in one sport, you cannot say you’re leaving that sport if your passion is there,” he said in an interview in his hometown of General Santos. Long-term coach Roach believes Pacquiao, 37, still has plenty left in the tank for a comeback despite being a veteran of 66 fights. “I have no doubt he will fight again,” Roach told USA Today. “He told me in the locker room after the fight [against Timothy Bradley in April] that he misses it already.